The evolution of the string quartet is continuing, as performers and composers rejuvenate and extend the musical forms associated with it, using augmented instrumentation and innovative presentation. In two great concerts, the Australian String Quartet worked with a percussionist and Zephyr Quartet with visual artists and sound effects. The Adelaide-based ASQ is a standard-bearer for excellence in playing and for bringing us the best of the traditional quartet repertoire. The ASQ’s performances of the Beethoven B flat major quartet (Op. 18, no 6), the opening work on this program, and Schumann’s A minor quartet (Op. 41 no1), the closing work, were delightful. This was the first time the Australian String Quartet had performed with its two new violinists, Dale Barltrop (first violin) and Francesca Hiew (second). The Quartet musicians are of the highest calibre and their understanding of ensemble playing is excellent. In between the Beethoven (a musical revolutionary in his day) and the Schumann, percussionist Claire Edwardes joined the ASQ for the premiere of Matthew Hindson’s fine new String Quartet No 4 for quartet and vibraphone, a magical work. The bell-like tones of the vibraphone contrast with the strings and while there is the potential for the vibraphone to dominate the sound, Hindson nicely balances the instrumental forces and brings each instrument to the fore. The first of the two movements is a bright, celebratory fanfare, written on the occasion of the birth of the composer’s daughter, and it proceeds at an allegro rhythm through a series of crescendi. The slower second movement is dreamily elegiac, even wistful, a lovely piece of writing for any combination of instruments, let alone one as challenging as this. The violin solo is built on a delightful melodic line, the interplay of the contrasting sounds creates a miasma of sonic light and colour and the mood gently invites thoughtful introspection. The mood became light-hearted with the ASQ’s performance of Claire Edwardes’ arrangement of three excerpts—Habanera, Rag the Bone and Judah to Ocean— from US composer John Adams’ 1994 work John’s Book of Alleged Dances. Each of these has a strong dance rhythm but, as the steps had not been invented, they remain “alleged” dances. Adams scored the dances for a quartet using a pre-recorded tape of a prepared piano, but in her wonderful new arrangement, Edwardes has transcribed the taped piano element for percussion instruments that retain the playfulness and the sonic character of the original. 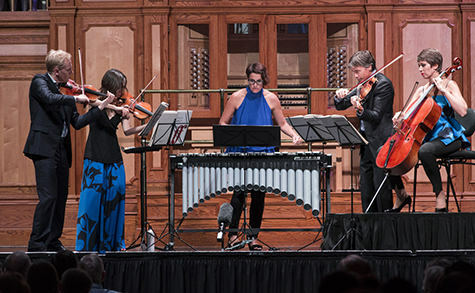 The close understanding between the five performers that results from this transformation of Adams’ work makes for lively and enchanting music. In 2015, Zephyr Quartet won both Arts SA’s award for innovation and the corresponding Adelaide Critics Circle award, acknowledging their extraordinary concert Music for Strings and iThings. Zephyr has a long history of collaborating with artists in a variety of media and they have an unlimited supply of new ideas. This program, Exquisite Corpse, is inspired by the parlour game created by the Surrealists in which several people contribute to an accumulating artwork. Zephyr has adapted the game by engaging a diverse group of contemporary composers—Zoë Barry and Jed Palmer, Zephyr violinist Belinda Gehlert, Jarrad Payne, Andrea Keller, Jherek Bischoff, Adam Page, Robert Davidson, Kate Moore, Erik Griswold, Jason Sweeney and JG Thirlwell—to contribute elements to the composition of a single work for string quartet. The result is a unique piece of music lasting an hour in total. Each composer’s contribution, of several minutes, builds on the previous contributions. As you listen you try to guess who the composers might be. The work is supplemented by a video installation. The quartet sits behind what looks like a giant octopus with tentacles spreading across the stage. As the audience enters, the octopus emits smoke and, as the performance progresses, its tentacles glow with coloured lights and there are video projections on its body and on a screen behind the players. As the music unfolds we see a succession of cartoon drawings of bizarre, surrealistic, but very cute creatures. The delightful animations by artists Jo Kerlogue and Luku Kukuku evolve in tandem with the music. 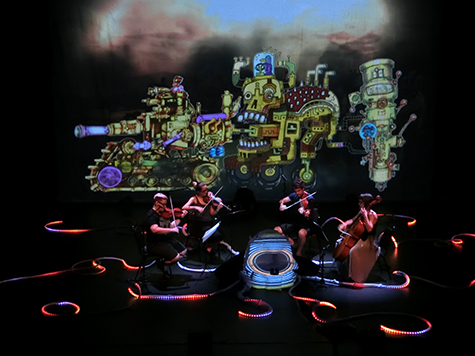 To emphasise the surrealist character of the composition, the players are closely miked and the amplified sound mixed to create subtle effects such as echoes, looping and distortion, underscoring the fantasy imagery. There is some fine writing in Exquisite Corpse’s 11 continuous movements. The music is generally tonal and melodic, nicely voiced for a quartet, and many passages display a strong jazz influence. There being no single composer, no overarching character or theme emerges, but the result is a lot of fun and the graphics are superb. Exquisite Corpse should be made into a movie. Zephyr’s artistic direction prioritises new ideas and collaboration, and they have again produced an experimental work that should inspire further development. In assembling what is in effect a collective of composers, artists and performers for this concert, their approach is a significant departure from the traditional role and functioning of a string quartet. Once Zephyr has realised an idea, however, they typically move onto the next; it would be interesting to see them further refine this kind of work.